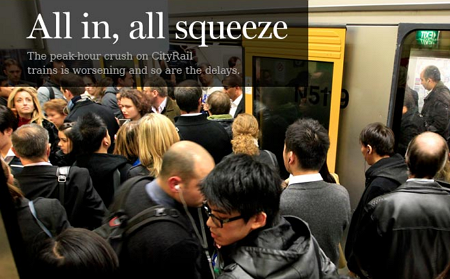 CityRail, 2015 Is the Year Your Customers Will Speak. It's towards the end of 2014 and there has been no design changes to the network, no new trains, the trains are less secure and not maintained as well as they should be. So as a customer im asking you what are we exactly paying for? Im sure that if we did a test of the air we would find that the required 8 Litres of fresh air per hour would not be met, telling me that we are likely to be breathing in carbon dioxide. Your train network suffers from bad design, it's a domino effect on your network. All it takes is for one train to have a problem and then the problem starts spreading through the network. Im an IT engineer and in our type of networks we use words such as redundancy and fail over something your networks do not have. If Cityrail and the train network is to make it past 2020 without a multitude of customers walking away you need to build that redundancy into the network. It's no longer acceptable to be given an excuse such as the train being delayed due to a freight train going slow ahead. It's not our problem and it's a poor excuse. The train that was delayed this morning was delayed because it rained for 30 minutes. Im sure you can see where im going with this, enough. When a bit of water can hamper your operations and stop trains from running on time you should be concerned. As for the 4 carriage trains, you well know how many people need to commute at particular hours and these 4 carriage trains are not acceptable either. You blantantly ignore the reality, offered up too many new services and then realised you did not have enough trains to provide all those services. WOW.. you need a new planning team. So the answer is simple you offered more services.. get a few more trains and do the right thing. 2015 is going to be the year that customers start walking away from your services. We need to draw the line and say enough is enough. We will come back when you improve. I urge current customers of Cityrail to rethink how they will travel in 2015, and be open to alternative transports. As for alternative transport, we're working with a team of service providers to get things rolling so customers do have a choice and can actually stand and say no to Cityrail. A luxury bus running from the Central Coast to Sydney is what people are looking for. People may actually start to enjoy travelling on public transport once again.